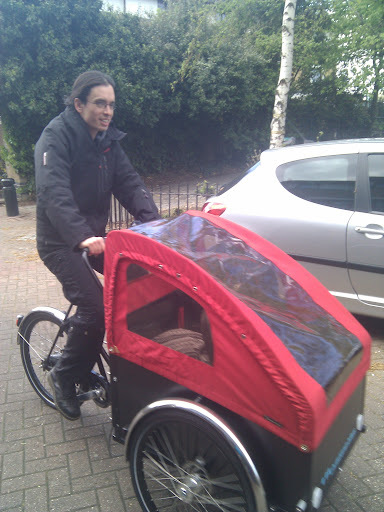 Simply Bikes has a guest post by Juliet Kemp, London-based Christiania Mum. Her son has just graduated from car seat to soft seat. She has some words of advice. We had an extra lap belt fitted to the floor of the cargo box, and acquired a second-hand car seat to strap in, parent-facing. After some experiments with a bag of rice, we packed it in with some polystyrene blocks to avoid any rocking (if I did it again, I’d borrow a few different car seats to see if we could find a flatter-based one). The first real-life experiment was when L was 5 weeks old, a round trip of just under 2 miles to the allotment. He slept on the way there, and stared out thoughtfully (or possibly, given his age, just myopically) on the way back. Success! Being able to get back on a bike with my baby so quickly has been fantastic. I’ve been able to get a bit more exercise in, for one thing. But it’s also made some local journeys much more possible. A five to ten minute bike ride each way feels like much less of a mission than a twenty to thirty minute walk, and both our local shops, and my local breastfeeding drop-in cafe, are twenty plus minutes away on foot. I just wouldn’t have made it out as often without the bike, and I think I’d have suffered for it. Leon has mostly seemed happy in it; our big problem has been the poor road surfaces round here, as he really dislikes bumps. I’m hoping that when he’s sitting upright he’ll find this easier to deal with. But I take things super-slowly to minimise bumping, and, reassuringly, he’s fallen asleep in the trike several times. The lack of shade in hot weather led to a grouchy baby once or twice (a muslin tied over the seat helped); as did my putting the rain-cover up when it wasn’t raining — it gets pretty hot in there, and L runs warm. As of this week (nearly 8 months), he’s graduated to sitting up strapped in on the box seat, which is very exciting. I’m so glad we bit the bullet and got him in there as early as we did. It’s been great for me and I’m sure it’s a fabulous start for him to get used to cycling as early as he has!